CLEMSON, S.C. (AP) — Clemson may have made all the statements it can during the regular season. And don’t expect the second-ranked Tigers to look to pile up style points against unranked opponents to impress the College Football Playoff panel down the stretch. Tigers co-offensive coordinator Jeff Scott said the team knows if it takes care of business during the season, they’ll end up among football’s final four as they have the previous three seasons. “We’re very comfortable and confident that if we continue to play well, we’re going to be where we want to be at the end of the year,” Scott said Monday. The Tigers may not play another ranked team until the postseason — their four remaining ACC opponents in Florida State, Louisville, Boston College and Duke are a combined 5-10 in league play. The stretch run begins Saturday at Florida State (4-3, 2-3 Atlantic Coast Conference). The Tigers have a road game at Boston College on Nov. 10. They also have home games against Louisville (Nov. 3), Duke (Nov. 17) and South Carolina (Nov. 24) before the ACC title game. Clemson (7-0, 4-0) took a major step toward their fourth consecutive appearance in the league championship game when it turned an undefeated showdown into a one-sided runaway with its 41-7 pummeling of No. 22 North Carolina State on Saturday. Freshman Trevor Lawrence was named the ACC rookie of the week after throwing for a career-best 308 yards in beating the Wolfpack. Don’t expect Swinney, though, to start trying to impress the CFP committee. The Tigers reached the playoffs each of the past three seasons, the last two years despite falling to an unranked opponent in the middle of the year. 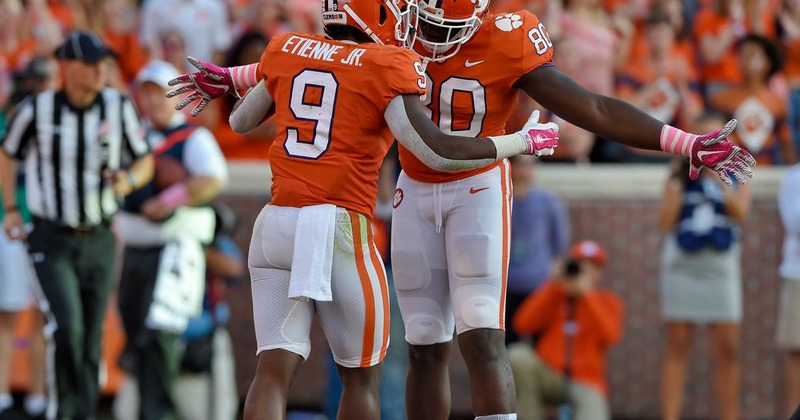 Clemson got a boost from seeming playoff locks losing the past two weeks. The Tigers moved up a spot in the rankings to No. 3 on Oct. 14 after Georgia’s loss to LSU, then jumped another spot this week when Ohio State fell to Purdue. Senior tight end Milan Richard said players have learned to demand the best of themselves and not be concerned with outside voices asking for bigger margins of victory. Scott said the coaching staff has used upsets as a reminder to tighten up and stay poised in all situations. “When you’ve got that bullseye on your back and you’re going to get everybody’s best shot, it requires you playing well,” Scott said. Florida State is in its first year with coach Willie Taggart and the transition hasn’t been the smoothest. The Seminoles lost two of their first three to set off waves of panic among its followers. However, they’ve won three of their past four games and coming off a 38-17 win over Wake Forest last Saturday. Taggart understands facing Clemson is a bigger challenge for his young program. Richard, Clemson’s tight end whose part of three CFP teams, said he and his teammates will keep the weekly rankings in perspective until the final CFP poll that determines the playoff teams.